Can choosing the right retail store counters directly impact store sales? Absolutely. Cash register stations, generally the largest furniture pieces in any sales or showroom environment, are not only the literal point of purchase for customers, but their size makes them an integral part of the merchandising layout and design. Single or modular retail store counters, frequently called service or sales display fixtures, can help stores direct traffic flow, promote merchandise, and build strong customer relationships — all of which have a direct impact on sales volume. Any retailing establishment, from chain department stores to all-in-one neighborhood markets to single-operation boutiques to warehouse-style wholesale distributors, needs to accomplish two basic functions in order to successfully operate. First, they must inform potential customers what merchandise is available; and second, they need to successfully complete the transaction with the customer. Attractive and functional retail store counters are the key operating element for almost any shop, as they include visual merchandising fixtures and also transaction stands, thereby facilitating both necessary operational functions for successful retailing. 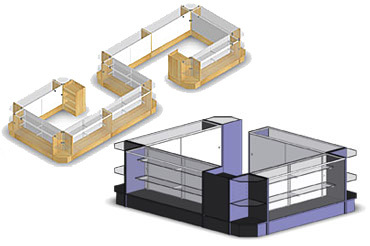 What are the primary types of retail store counters? The term "cashwrap" comes from the counter area within a store where 1) cash was exchanged for goods and 2) goods were wrapped for transport home. My, how things have changed! Today's retailing cash wraps are modular sales and service display fixtures that easily serve a variety of functions. 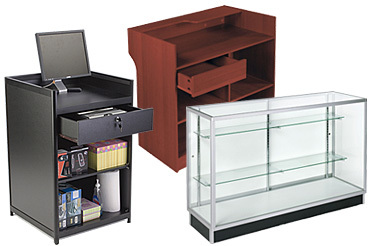 Glass-front display countertops, store counters with locking storage for extra merchandise or accessories, closed front stands with easy-change advertising poster mounts, open access corner kiosks, and adjustable-height enclosed shelving are only a few of the many display furniture styles available. Our modular cash wraps come in fully customizable layouts and designs to meet the needs of any retail or commercial space. Store checkout counters need to accommodate more than just old-school bulky cash register models. Contemporary retail store case styles are just as likely to use digital POS systems as they are manual registers. While some modern cash register counters incorporate traditional recessed tops and pullout cash draws, other styles are designed to take advantage of handheld touchscreen point of sale systems and maximize visual merchandising space. Individual cash register counters can be purchased to create custom builds that reflect the specific display and checkout station needs of any business. From traditional wooden checkout stands to modern tablet-ready glass countertops, store counters and cash wrap configurations need to keep up with changing point of purchase behaviors, programs, and operational requirements. Corded and wireless checkout systems, interactive inventory displays, digital coupons, and personalized online showrooming shopping are only a few of the many new developments in retailing and visual merchandising. 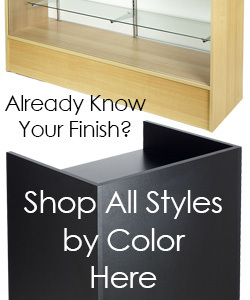 At StoreFixture.com, our huge selection of traditional and modern sales display fixtures includes a constantly updated collection of retail store cases and customer checkout solutions that will match the marketing and service furniture requirements of any business in any industry, in any style.